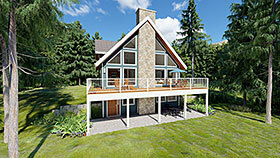 Here is the perfect recreational or year-round home. Big rooms, plenty of closet and storage space, and lots of glass to enjoy the view. Imagine unwinding in the Master Suite's private sauna after a hard day on the slopes. The width and depth shown includes the decks, the actual house size without decks is 30'-0" x 42'-0". Question: Do you have a version of this plan that is only the main floor - no basement and no upstairs? What is the width and depth without the porches? Answer: The similar plans we have are: Plan 99962 that is without the walk-out basement, it does however have the second floor loft. Without the porches it is 30’ wide by 46’ deep. Plan 99961 is 30’ wide by 42’ deep without the porches. Answer: Currently all the basement walls are acting as bearing walls, it is possible for these walls to be replaced by posts and beams. Question: What are the dimensions of the decks? Question: Is the chimney designed to have wood stove/ fire place in the basement as well as mainfloor? Answer: The plans currently are designed for a single flu fireplace on the first floor. 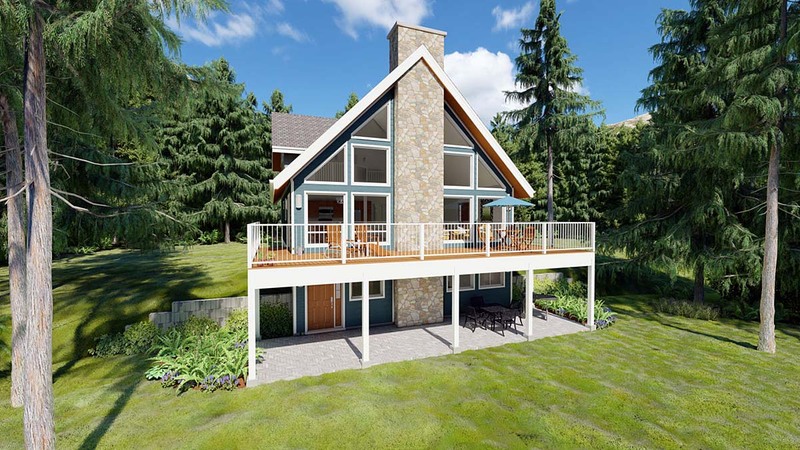 Answer: The plans are designed for stick frame over the main floor living area and trusses over the second floor. A truss company could do parallel chord trusses over the main floor if trusses are preferred, in most cases the would be able to provide the truss drawings for that. Question: Can this plan be modified to include a single car drive under garage? What are the ceiling heights and is or can the master bed be vaulted? Also, what is the unfinished square footage and the snow load? Answer: Yes, a single car garage could be added to the left side of the basement, the stairs are on the right side so it cannot be on that side. There would need to be some slight modifications to the structural supports in the basement, but this could be done by using beams. The ceilings are 8’ on all floors. There is a vaulted ceiling in the main floor living area and a vaulted ceilings in the master bedroom. The unfinished basement area is 1269 sq.ft. The plans are currently designed for a 50 lb. roof snow load. Answer: The plan is designed with roof joists, they can be modified to parallel trusses if preferred. This can be done by your truss manufacturer. Question: Do you happen to have any photos exterior and interior, of this plan previously built? Answer: Unfortunately, no we do not. Question: What are the dimensions of the master bath please? Also, with the kitchen island, is there cabinetry above or below the island? Answer: The dimensions of the en suite are 9’-0” x 12’-9”. The kitchen island has cabinetry below but none above, however cabinets could be added above in the homeowner wished to do so. Question: Does the 38 foot width and the 58 foot length include the decking on the front and sides of the house? Answer: Yes all decks are included but not the steps down from the side deck. Answer: It is an unfinished basement with the stairs located under the main floor stairs with a center beam and bearing wall down the center. Question: What building code and year are these plans designed to? Wanted to check snow load and wind speed. Answer: Thank you for the inquiry about our plan number 99961, the plans are designed for a roof snow load of 50 p.s.f., the plans are designed to meet IRC code requirements in the US as well as NBCC requirements in Canada. The building is designed for normal wind loads, any snow or wind loads outside of what is specified in the codes mentioned would require review of the plans by a local professional engineer. Most ski hill or high snow or wind load areas usually require an engineer anyways, so this is not unusual. Click Here to download a free PDF Brouchure of Plan Number 99961.